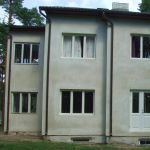 We have finished one big project of this summer - facade works of a functionalistic house at the heart of Nõmme, on Liiva street. The old house got a new plastered facade of 300 m2. We removed the old facade covering materials until the vertical logs. Some of the logs needed to be replaced, we did it with good wood from an old log-house. Few logs needed antifungal treatment that was made by Antivamm Ehitus OÜ. Logs damaged by fungus were partly replaced. We used natural breathing materials for renovating the facade: flax tow and felt, fiberboard and reed board. We plastered the reed board in three layers. We used an old Swedish recipe: lime putty, smashed limestone and different sands. The plaster was fully reinforced with plastering net. We used 25 tons of plaster. We begun with the works in the middle of May and finished at the end of July. We are thankful for the house owners for good cooperation. Comments from the owners: We had planned the facade works for several years, but we couldn't find a suitable building company. Säästvad Ehituslahendused OÜ was the first one with a clear vision about the work and who had professional requirements. It created reliability. We are more than happy about the results. The working team was friendly, helpful and very laborious. All the works were made for the deadline that was very important for us. The cooperation with Säästvad Ehituslahendused OÜ continues already next year when the facade will be painted and the basement will be heat insulated. As we know the diverse profile of the company we also would like to have them for renovating the ground floor of the house.